England's Michael Lumb bats during an ICC Twenty20 Cricket World Cup match against New Zealand. 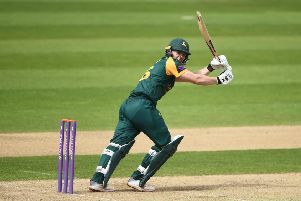 Nottinghamshire batsman Michael Lumb says the English cricket needs to take inspiration from the success of Australia’s T20 Big Bash League. Lumb, who plays for the Sydney Sixers in the annual eight-team tournament, believes the English product needs to improve in order to attract new fans to the sport and boost attendances. Speaking to ESPN Cricinfo, Lumb said: “The UK is crying out for a city-based franchise. Playing in T20, we have fallen way behind. Compared to the IPL and the Big Bash, I think we’re nowhere. “The crowds aren’t as good. I definitely think we can improve our product. “I think the suits in England need to get out and watch the game over here and see what this is about, because we are falling way behind the rest of the world. “City franchises might alienate a few, but the new T20 competition is totally different to the traditional County Championship. Lumb has represented Nottinghamshire for the past three years after time with Hampshire. During his time at Trent Bridge, Lumb has been witness to some of Nottinghamshire’s best ever domestic attendances. 2014 saw Trent Bridge attract record crowds for the NatWest T20 Blast, passing 10,000 for the tournament’s opening fixture against Lancashire Lightning, and again for the visit of Leicestershire Foxes and the Outlaws’ quarter-final against Hampshire. Between 2013 and 2014, Trent Bridge has seen a 50.2 per cent rise in attendance with the addition of those two extra fixtures, from 40,605 to 60,982 in 12 months.